First up, the away kit. 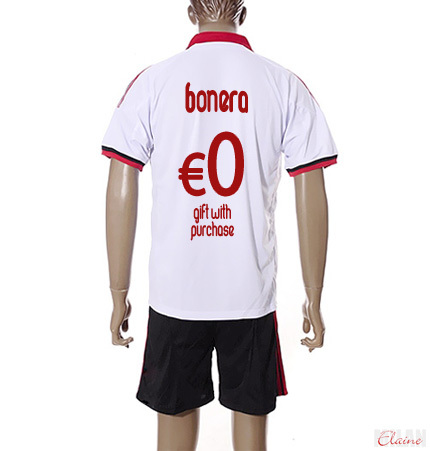 In keeping with the collar theme, the traditional white jersey has a red collar and a small placket. The sleeves are trimmed with red and black rib to echo the red and black horizontal stripes across the chest. Outside of the collar, which you all know I hate, I really like this kit for its simplicity. It’s almost as if it echoes the financial state of the club and shuns austerity. The lettering on the back of the kit particularly intrigues me. It’s modern, very reminiscent of current events, and yet shamelessly simplistic. 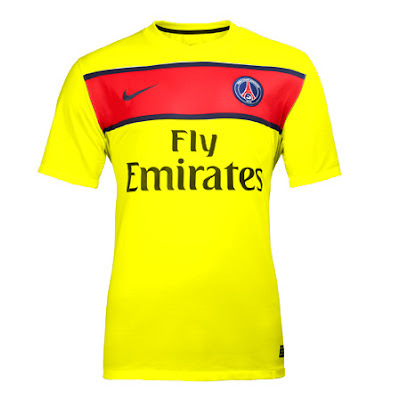 Now for the one you’ve all been waiting for: Galliani’s lucky yellow third kit. Notice the very simple crew neck, with the bold stripe placed high across the chest. It’s almost like a training jersey, and yet the futuristic logo says “we’re going places.” I think this one could sell enough jerseys to refinance the entire club. So there you have it, 3-4 weeks early. And remember, you heard it here first. With all of the rumors flying around, it’s important to know your sources. For info. on when your favorite Milan players are playing at the Euros, check here.